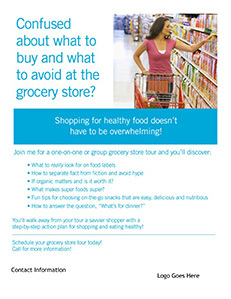 Grocery Store Tour FlyerOne of the BEST programs I offer is a Grocery Store Tour for my clients! They love it, and it is a wonderful addition to your one-on-one program. Offer a one-on-one tour or group tour; include it as part of your program or as an additional program…it’s up to you! Use this FREE flyer to promote your shopping tour and help people learn how to be savvier, healthier shoppers!